August 5, 2016 – Today, we’re going to hear from author, journalist and producer Denise Kiernan. 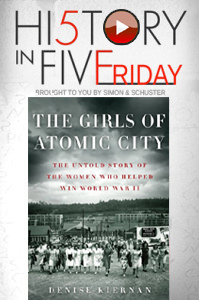 Her latest book is, The Girls of Atomic City: The Untold Story of the Women Who Helped Win World War II . Kiernan is the author of several history books, including Signing Their Lives Away: The Fame and Misfortune of the Men Who Signed the Declaration of Independence , and Signing Their Rights Away: The Fame and Misfortune of the Men Who Signed the United States Constitution . You can follow today’s History in 5 Friday author on Twitter @DeniseKiernan, and visit her online at DeniseKiernan.com, or GirlsofAtomicCity.com. To meet the British counterparts to the Girls of Atomic City — the code breaking WRENS who cracked the riddle of Hitler’s Enigma machine — visit Bletchley Park Trust online, and subscribe to the Bletchley Park Podcast on iTunes or Audioboom. And remember to subscribe to the History Author Show on iTunes, like our iHeartRadio page, or make us appointment listening on your Android device, so you don’t miss an installment of History in Five Friday. It’s the perfect way to kick off your modern weekend… with people from the past.